It looks like there are a lot of views for the site, so now I feel an obligation to post regularly about what’s going on, even if it isn’t a camping adventure. Had a great meet-up this Monday with friends at Kennesaw Mountain for a walk – just about 5 miles for some of us who needed to get in the steps. Karen, Kevyn, Jennifer, Jennifer with her dog Molly, Starr, Carla, Lynzee and Anna were there for the morning walk-and-talk. Something of a group therapy session, since we could chat about the good and bad of the recent year of teaching. I didn’t get a picture, but I think Kevyn did, and if he wants to share one, I will post it. Most of the conversation was about how short the summers are for teachers and how it really has become a working vacation for most of us. For those of you who aren’t teachers and who might be saying “hey, you get the summer off, quit complaining” our answer would be “try a year of teaching and you will understand how much you need a few weeks off” (without pay, I might add) to decompress, get caught up with your normal life and just unwind from the stress. Unfortunately, the summer weeks have become required staff development and training, often unpaid. Several walking with us will spend the next 2 weeks in science or math training sessions to learn the updated curriculum and new ways to teach students. Not that math is really any different or science has suddenly changed, just that there are “new” ways to present the material, new terminology and new pacing guidelines to increase the all important student achievement. Bit of editorializing there, but it was supported by an article in the AJC this week detailing how much is expected of teachers now, with so little in return. I could go on about all the crazy expectations of teachers, but I will save that for another day. Back to camping and RV adventures for a moment. 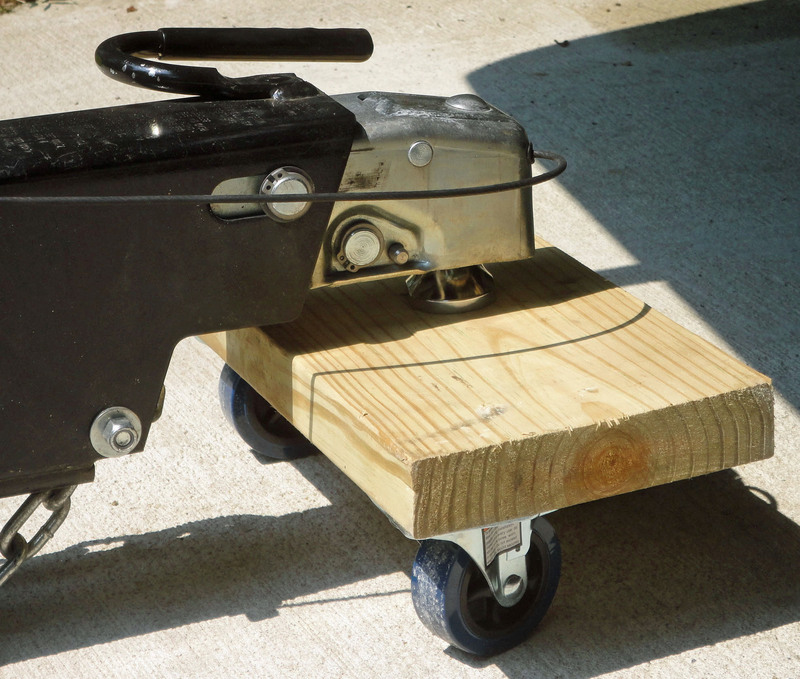 I made a little “hitch helper” for the hitch end of our tow dolly this week that makes moving it around much easier. 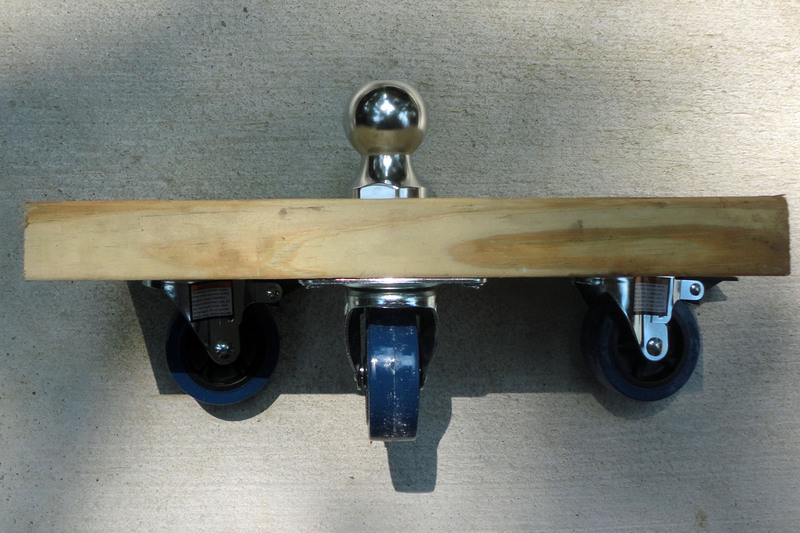 Essentially three caster wheels on a board with a 2″ hitch ball so you can hitch the tow dolly to it and roll it around as needed. Right now it is rolled under the back of the RV and taking up no more space in the driveway. (After using it a bit, I would probably redesign it to include a balanced 4 casters or cut the wood as a triangle). Also, we just booked two weeks back in St. Andrews State Park for next June at the site next to the one we had this year — Yippee! If you are planning to be camping in the state park next year at that time, let us know — and if you aren’t, why not? Side view of casters and hitch ball.